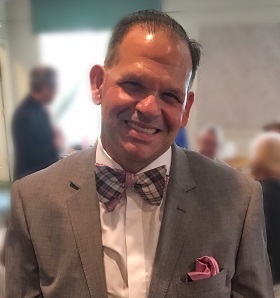 Mark S. Colicchio is an experienced New Jersey-licensed Health Officer and Registered Environmental Health Specialist, who has worked in the field of Public Health over the past 24 years at various agencies throughout the State of New Jersey. He holds a Master’s Degree in Health Sciences with a concentration in Public Health Administration from New Jersey City University and a Bachelor’s Degree from Saint Peter’s University, with a major in History. He is currently the Health Officer for the City of Elizabeth where he plans and oversees various Public Health programs and activities for the city, including Epidemiology, Communicable Disease, Public Health Nursing, Environmental Health, Animal Control and the Office of Vital Statistics. In addition, he has served as an adjunct professor at several universities, teaching courses pertaining to Public Health, such as Introduction to Public Health, Epidemiology, Environmental Health, Public Health Law, and Public Health Planning. Mark Colicchio is a member of several Public Health Organizations and serves on numerous committees relating to Public Health to include New Jersey Association of County and City Health Officials, the Union County Health Officers Association and the New Jersey Department of Health’s Communicable Disease Advisory Committee. He uses a collaboration model with various government, public and private agencies to plan and effectively implement Public Health Programs that benefit the residents of the City of Elizabeth.